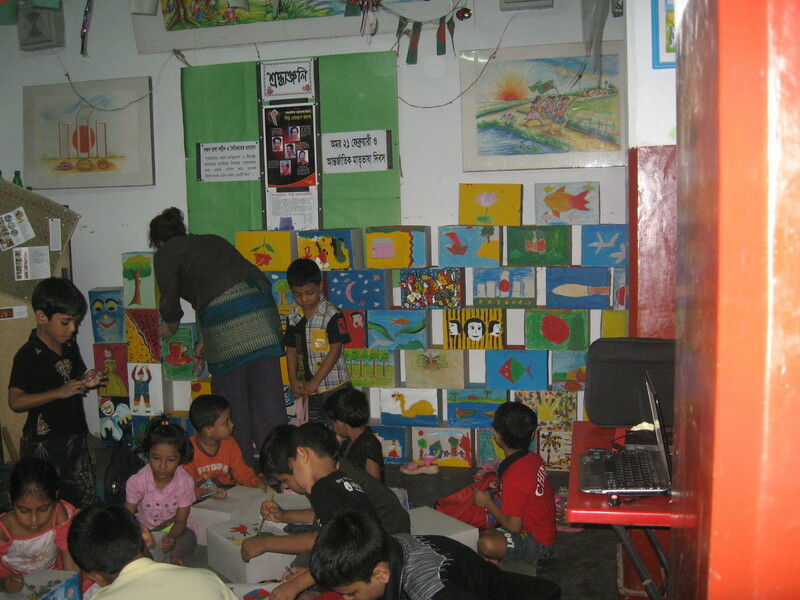 Yesterday I went back to the little art school I visited in old Dhaka to do a small project with them. Was such a pleasure. Could have been disastrous with 300 children working with paint etc in such a small space, but staff and students all so excited and accomodating that it went well. Tried to explain first through showing the children pictures on my laptop. 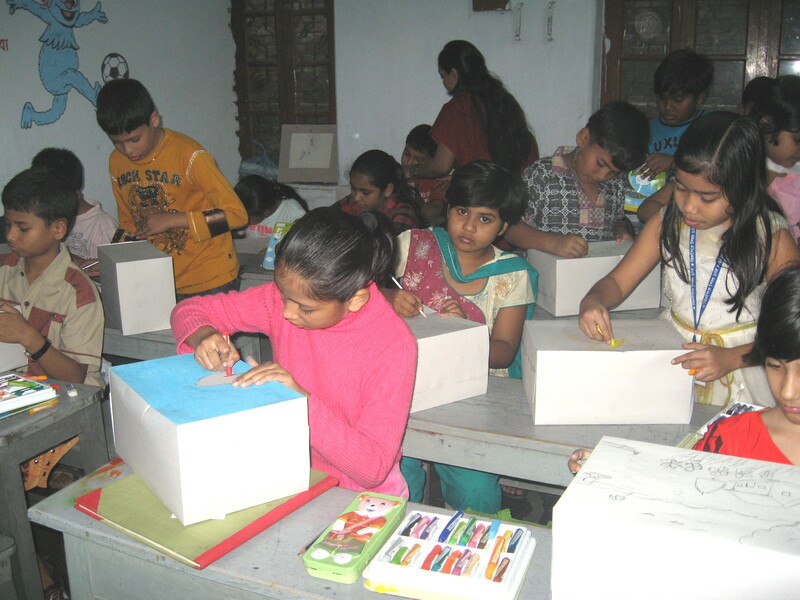 Went from class to class, showing pictures and handing out boxes, that we had organised through a local factory. In only 3 hours the children and staff produced a massive amount of work which we built into a structure in the largest room. So crowded, especially with parents watching, but no-one seemed to mind. Built right to the ceiling. Lovely to see the kids’ delight. Main thing is the staff can now work on similar/better projects of their own. 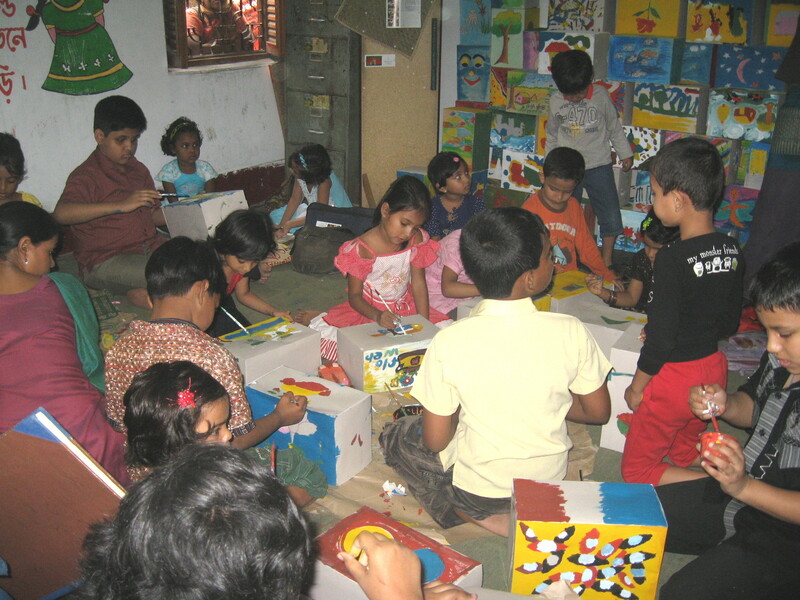 Perhaps because these small children are so used to working carefully in small spaces, amid chaos, they took it in their stride; no paint or tears spilt! Was pleased that the more they got into it the more they painted freely, used their fingers etc. Nice thing was being able to work so quickly and complete whole project so children actually got to help with the building themselves. Had a team of very helpful gluers running up and down ladder and passing boxes (no health and safety issues here!). Sadly, I gave my camera to a member of staff to document the project but didn’t give spare batteries so have no image of the final structure. Britto came and filmed the project though so I am sure there will be images on their website. Will add one later if I get one. Was more about process though really. We all went for lunch afterwards at ‘Beauty Boarding’ a famous old eatery where they tell me artists and intellectuals of old Dhaka have met for years to sit and chat/eat in the central courtyard. Very nice day.